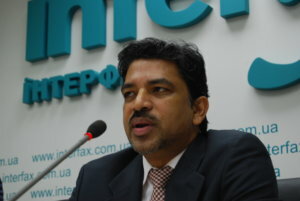 The Embassy of India in Kyiv in cooperation with the Pharmaceuticals Export Promotion Council of India (Pharmexcil) and the Indian Pharmaceutical Manufacturers Association (IPMA) will hold an annual business seminar in Ukraine to promote and demonstrate the potential of India in the pharmaceutical manufacturing sectors, Indian Ambassador to Ukraine Partha Satpathy has stated at a press conference at Interfax-Ukraine. “Pharmexcil is the Pharmaceuticals Export Promotion Council of India. The main task of this organization is to unite all important pharmaceutical manufacturers in India. The council cooperates with the government, represents the interests of manufacturers in exports, in particular brings pharmaceutical products in compliance with the requirements of the WHO and the importing country,” the ambassador said. President of the Indian Pharmaceutical Manufacturers Association (IPMA) Dr. Menon, in turn, said that Pharmexcil plans to present several projects in Ukraine. “Pharmexcil wants to find partners in Ukraine in the field of Ayurveda, clinical trials and create a joint venture for production of medicines,” he said. The Indian ambassador noted that India is the third largest exporter of pharmaceutical products to Ukraine following Germany and France in terms of value, while Indian pharmaceutical companies supply high-quality products at a very good and competitive price.